GALESL.weebly.com - Q & A: Help with International Accents, Page 4: Using IDEA - G. A. L. E. S. L.
First I go to the IDEA home page. In the menu at the top, I click on "Dialects and Accents". I look for the region that contains Iran: "Middle East" and click on it. On the Middle East page, in the menu on the right, I look for "Iran" and click on it. On the Iran page, there is a list of speakers, with country name and a number (Iran 1, Iran 2, Iran 3, etc). 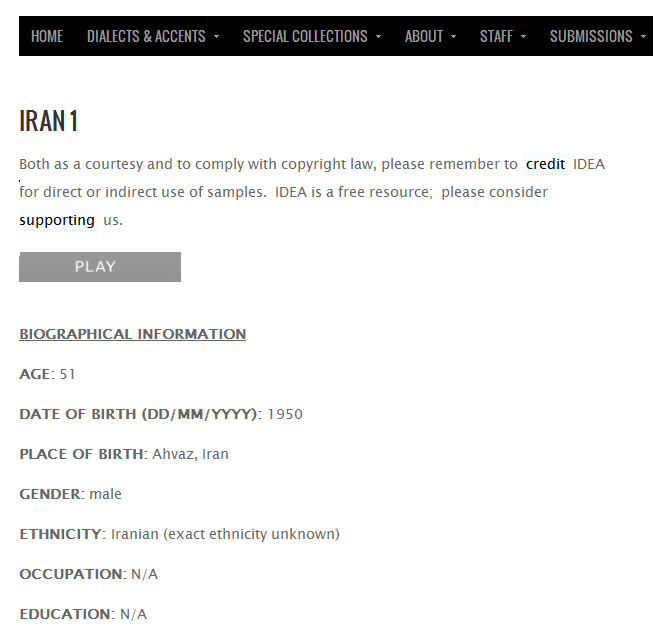 I click on Iran 1.
International Dialects of English Archive, the table of samples for Iran. I use the "Iran Three" link in the *left* column to get the MP3, and click on "Transcription" in the right column to read the text of what she says after the standardised passage. At the top is a button marked "Play". I can click this to listen to the audio. Below is biographical information about the speaker (age, gender, life history etc) and transcripts or links to what the speaker says. I click "Play". IDEA has speakers do at least 2 things: first they read a standardized passage like "Comma gets a Cure" or "The Rainbow Passage"; then they talk about themselves and their knowledge of English. Sometimes the speaker will finish with a a short sample of their mother tongue. Below the biographical information, there is a link to the standardized stories. Further down is a transcript of what speaker says about themselves. 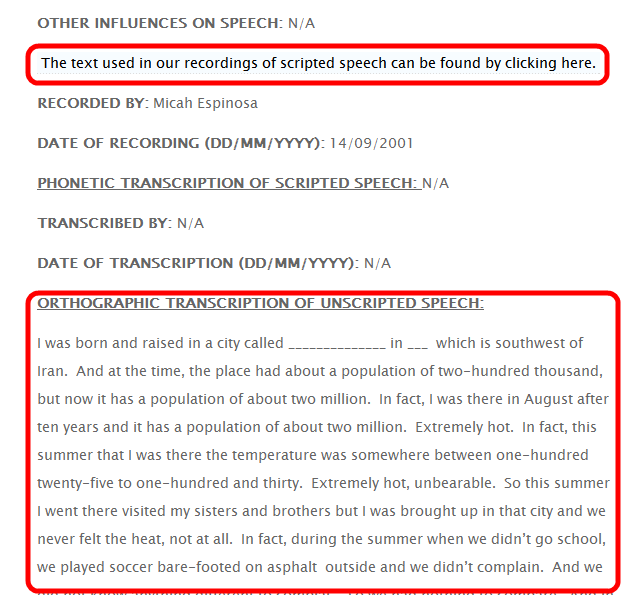 IDEA: link to standardized passages & transcript of unscripted speech are circled in red. I read the text as the speakers speaks, so that I really understand, and I become more familiar with their accent. To become more familiar with the Iranian accent, I go back to the country page for Iran, click on another speaker and listen to them too. IDEA's website & organization was updated in 2012 and is more user-friendly now. In my short testing (using Iran as an example), the content is great. They have many speakers for the country, they used a long standardized passage and it's followed by a personal story (in case you get bored of hearing the same standardized passage over and over again). I just wish they had the audio and all the text on the same page. Next, I discuss using a similar site, the Speech Accent Archive.